There are currently 106 people online. 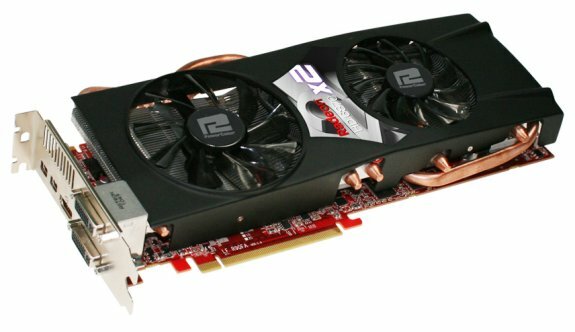 PowerColor also announced a dual-GPU Radeon HD 6870 card. It has 900MHz GPUs and 2GB GDDR5 clocked at 4200MHz. Outputs include DL-DVI-I / SL-DVI-D/ HDMI/2 x mini Display Port. TUL Corporation, a leading manufacturer of AMD graphics cards, today announces the very first dual GPU solution with BART XT graphics engine: the PowerColor HD6870X2. Powered by dual graphics engine, the PowerColor HD6870X2 delivers ground-breaking performance against the competitors and takes the game to the next level, enabling an unprecedented gaming experience you’ve never felt before. The PowerColor HD6870X2 has 2240 stream processing units and 4.03 teraFLOP’s of computing power, easily accelerating the gaming speed and maximizing the gaming power with 900MHz core speed and 1050MHz memory speed, fully tackling the most demanding game titles and allows the amazing gaming experience. Furthermore, the HD6870X2 takes advantage of Heat Pipe Direct Touch (HDT) technology; with 6 pieces of flattened heat pipes directly cover the GPU, allows 50 times better heat dissipation than copper base, provides an extremely cool working environment. The latest dual core solution also equipped with “Platinum Power Kit”, including 13 phases PWM, ferrite Core Choke and DrMos; all these superior components provided the ultra stable platform and great power efficiency.